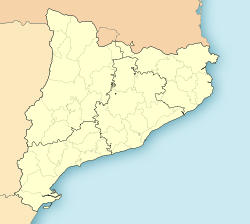 Olesa de Bonesvalls is a toun in the Alt Penedès coonty in Catalonie, Spain. It is locatit in the Garraf natural pairk, whaur Montau, wi 658m, is the heichest muntain. Olesa is a bonnie place; a medieval refugee for travellers (S. XII); a neoclassic kirk (SXVII), well kept vineyads an dry stane constructions scattered aroond the toun that wur uised as refugees for shepherds are the maist teepical elements in Olesa. Olesa is kent for haein the deepest caves (avenc) in Spain; an aw "L' avenc de l' esquerra", 206 m, bein the deepest. Avinyonet del Penedès an Begues are the closest touns to Olesa, an it is anerly 30-45 minutes drive frae Barcelona. ^ Olesa de Bonevalls became part of the Alt Penedès in the comarcal revision of 1990: previously it formed part of the Garraf. This page wis last eeditit on 11 Mairch 2018, at 10:43.